Greenfield Village, Dearborn – Andy and I visited Detroit in 2012 so I could return to my old teen stomping ground. It’s an end of an era. Today my Dad is retiring. He has been a calibration engineer with Ford Motor Company for over 35 years, so I have never known him to do anything but “play*” with cars. Ford Motor Company has been good to our family. Ford allowed us to have a pretty good childhood and a 1001 experiences most kids don’t have. The number one experience was probably the opportunity to live in America for two years. Whilst living in the States was experience enough, one of the best things about Dad’s job was the travelling. 42 states in under 2 years! That’s more than most Americans see in a lifetime. How did we see/do so much? Well, because of Dad’s job. In a nutshell, as he used to explain when I was little . . . “My job little Claire, is to make sure that when the driver turns the key in the ignition, no matter where you are in the world (up a mountain, in the desert, in a jungle), the car starts and drives just as you expect.” This meant we were able to travel with him to the mountains, deserts, um. . . we never did get to a jungle! We were so lucky. We spent summers travelling across the mid-States to Colorado (altitude testing), Arizona (dry heat testing), over to California and then on the way back through San Francisco, Yellowstone and the Badlands. Easter was spent in Florida for humidity testing, of course we needed to visit New Orleans and Disneyland too. And then we took our own “vacations” over to New York, Niagara Falls, Chicago. We really did a lot and I am eternally grateful. To Dad, for doing the job. To mum who pushed Dad to go for the interview all those years ago. And to Mr Henry Ford himself. So Dad. Here’s to you and your job at Ford. I can’t imagine you not being there. Not bringing home the @Ford Magazines. Not boring telling us all the latest news about the 1.0l FOX engine***. I wonder how quickly you’ll forget the acronyms and their meanings (for those who don’t know, I challenge you to find a company with more acronyms than Ford! It’s surprising you can understand people who work their as it sounds like they’re speaking another language). 1965 Ford Mustang Fastback AKA My Dad’s Car AKA My wedding car I was privileged to be driven to Andy and I’s wedding in my Dad’s Mustang. Such a beautiful car. Dad bought this whilst living in the States. What a souvenir! All the best in your retirement. Have fun. Keep busy. If you’re ever at a loose end, we have a giant garden here that needs tackling and a grandson you’re more than welcome to babysit! Dad and I snowmobiling in Lapland. I was out there working and Dad managed to come out to “play” with cars, so we managed to meet up for the weekend. It was lovely having him visit as sometimes Lapland was a bit lonely for a single lass in the snow. *he gets annoyed when we say that as he says his job is very hard! **Dad thinks it’s funny to call everyone their “little friends” even when they’re 30yrs+!!! 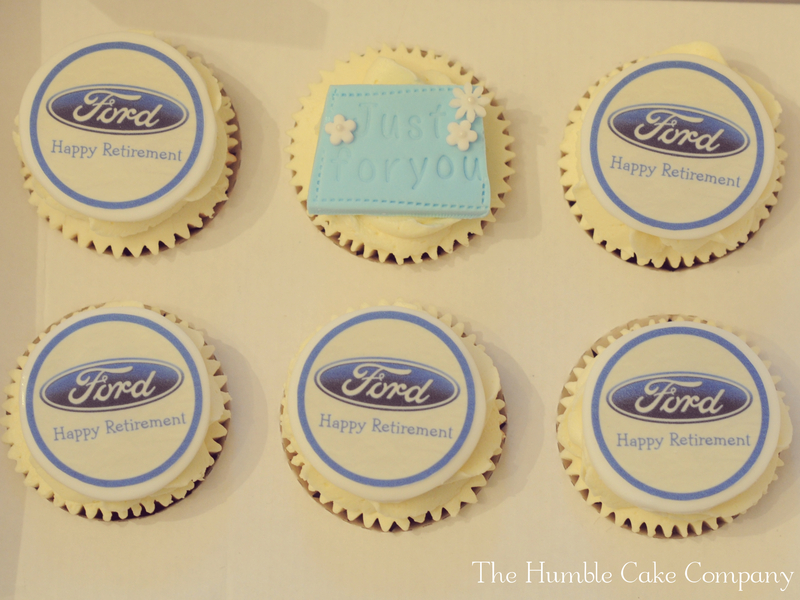 The Cupcake Toppers were created and supplied by The Cupcake Company , a fabulous supplier to the UK baking community. Check out Jade’s website for a plethora of goodies from bespoke toppers to logo design. The cakes were sent to Dad using the ever so clever Cakes Away boxes by Card Cuts. Dad reported that the cakes arrived in perfect condition. If you’re looking for cakey gift but don’t live in Northumberland, perhaps we can post them for you? Contact me here or via my Humble Cake Co Facebook page for details. ***Dad never really bored me actually! I was always a bit of a Tom boy growing up. I had a Capri as my first love car. I enjoyed talking to Dad about cars. Even got a job at Burrows in Shenfield working as Senior Account Manager on the Ford account. When I left, I was dubbed the CV Queen as I knew so much about Commercial Vehicles (sad, eh?) It was nice going to Dunton for work meetings and then meeting Dad in Ford’s own Costa for a sneaky cuppa before heading back to work – perk of the job! My Capri. How I miss her. Claire, The Humble cakes were lovely, a great surprise, and they tasted fantastic. I would have to say “Not So Humble” maybe that is another line to the Humble brand. We are so lucky Claire Ford has given us some great memories and you have captured some of them here. Well done. Also I am pleased I never “really” bored you.